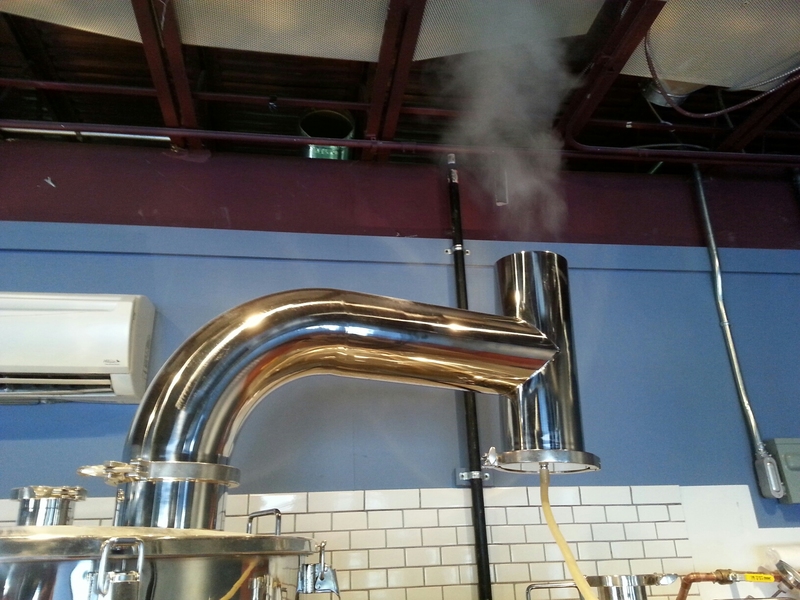 I fired up the boil kettle with 3.5 bbl of water that came from the hot liquor tank heated with the Eemax on demand heater with supplemental gas. 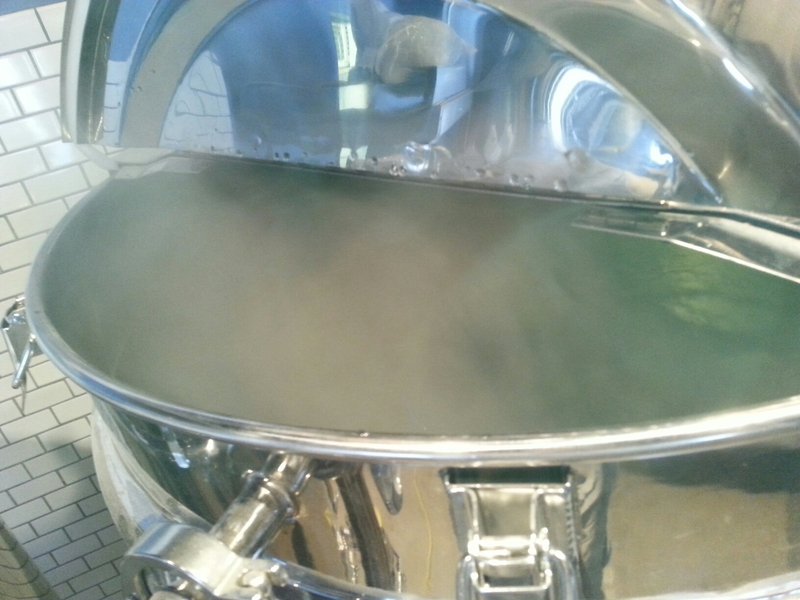 I simulated the brewday from getting the water heated for mash-in and then from sparging to boil. It has taken the last few weeks to get the main burner firing like I want it to, but I was finally successful. Now the Eemax is working with the coldest Akron water EVER but it took about 1.5 hours to get the water ready to about 170 degrees. 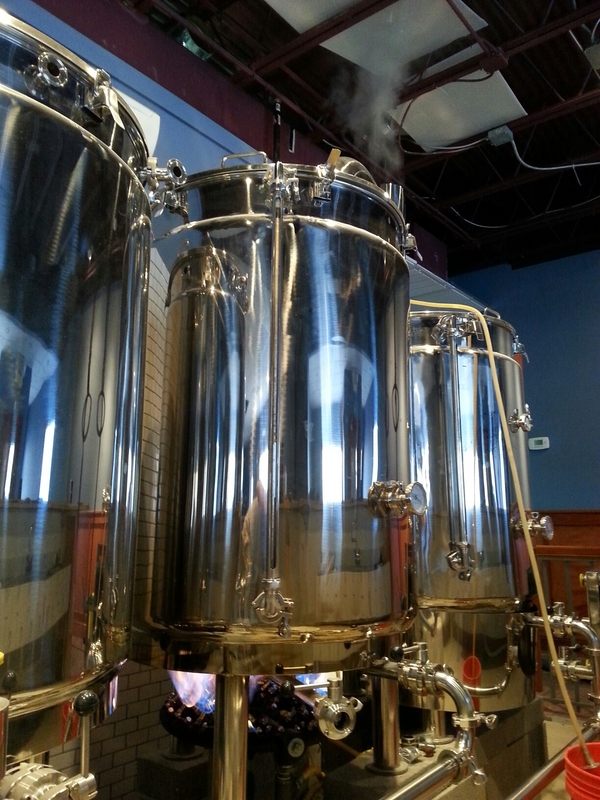 I was then able to get water boiling from the end of sparge in 30 minutes which is pretty darn good. Yes, it’s confirmed…it’s boiling water. A few weeks ago my draft equipment came in. But after it came in and I saw EXACTLY how the 12-tap, glycol-chilled draft tower was assembled, I knew I made a mistake. I should have ordered a trunkline with larger diameter lines as the restriction (resistance to flow) of the system was too much, I would then have to compensate by turning up the CO2 regulator to get it to flow and the beer would end up being overcarbonated after a few days. I technically did the calculations correct but I didn’t know enough on the draft tower. Enter Alex from Bierpros. He is a former Akron homebrew club SAAZ member that contacted me. 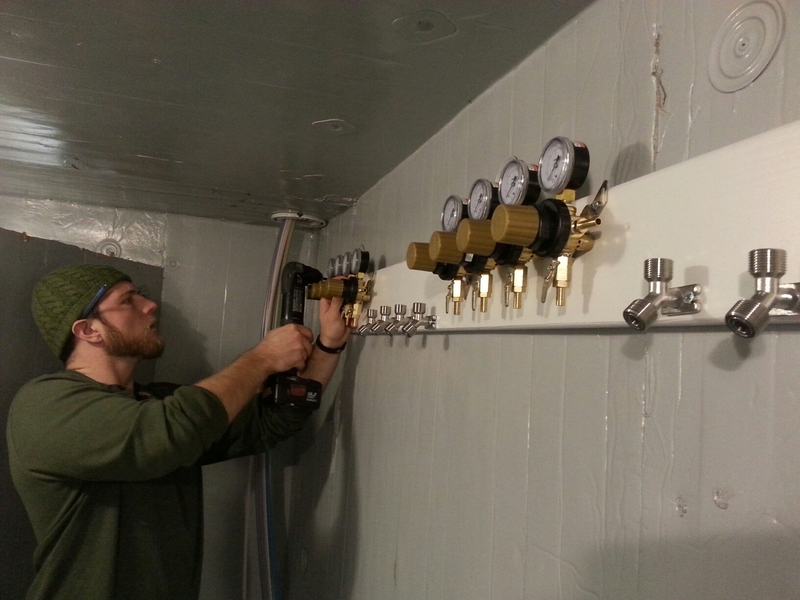 Currently he works for Bierpros installing and cleaning draft systems. 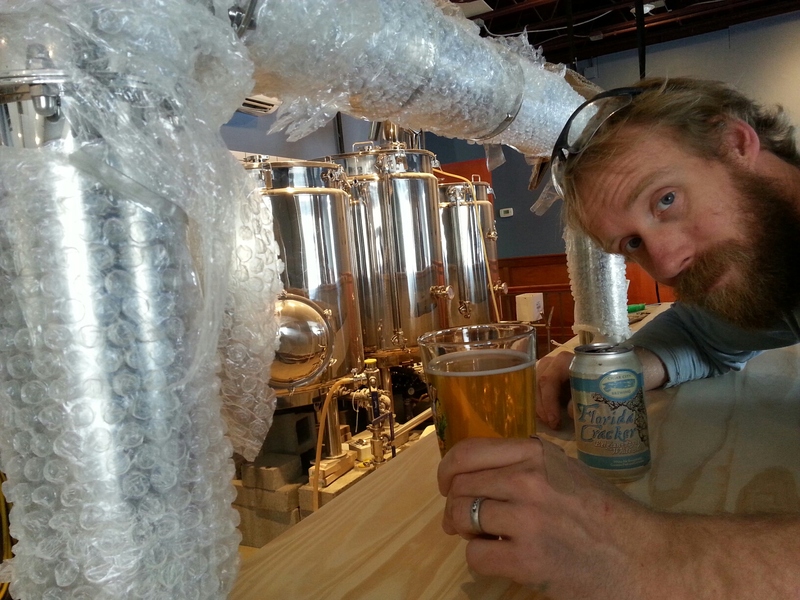 Before this he has worked for a few Akron breweries and before that, in dairy, where sanitation procedures are very similar to beer. He’s exactly the man to help with my problem. I told him my dilemma. The only solution was to either, A – send back the 45ft trunkline for one that was bigger in diameter (more beer sitting in line) – that would have been a PITA. Or B, use mixed gases. Alex told me that if I wanted a perfect pour every time no matter what – the distance or the line diameter, I needed to use mixed gases. He talked me into it. I ordered a gas blender and we got to work helping me put all my parts together. 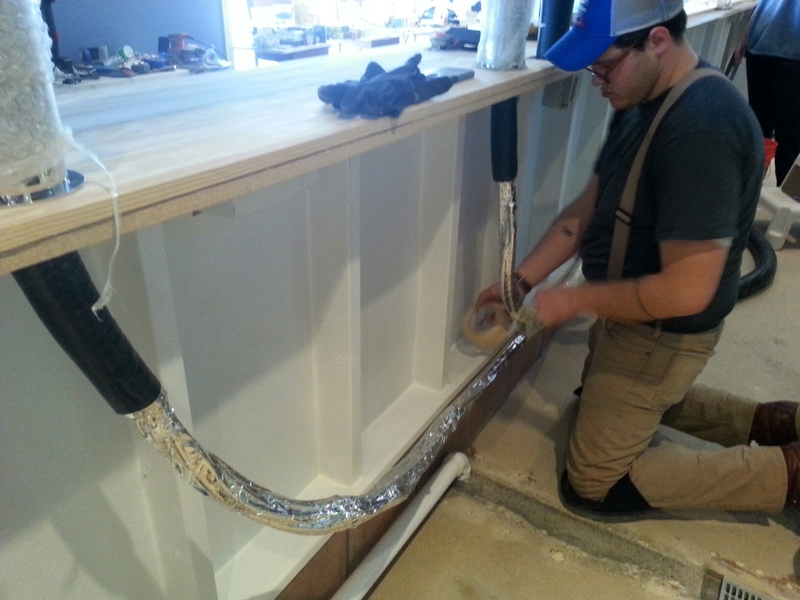 Alex added additional ‘restrictive’ tubing to slow this beer waaaay down. 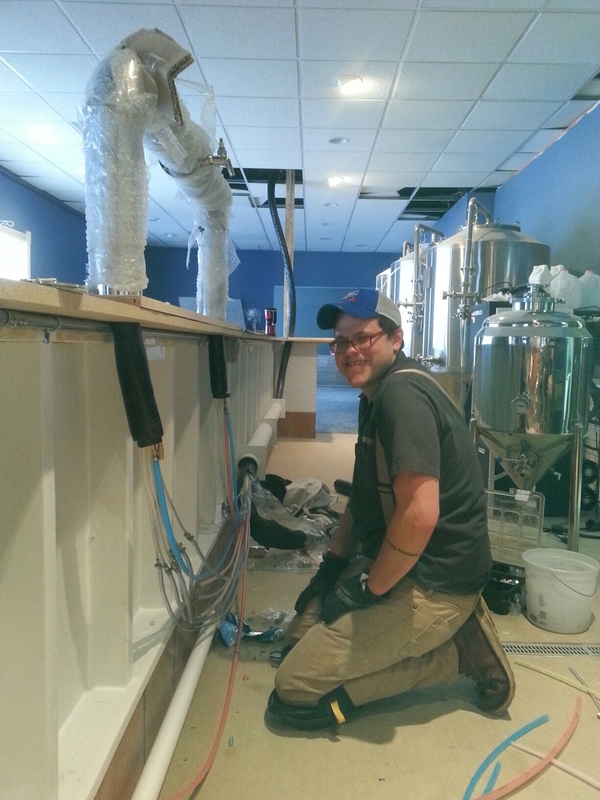 Now that the lines are connected to the tap, Alex is hooking up the glycol lines to keep the beer cold. 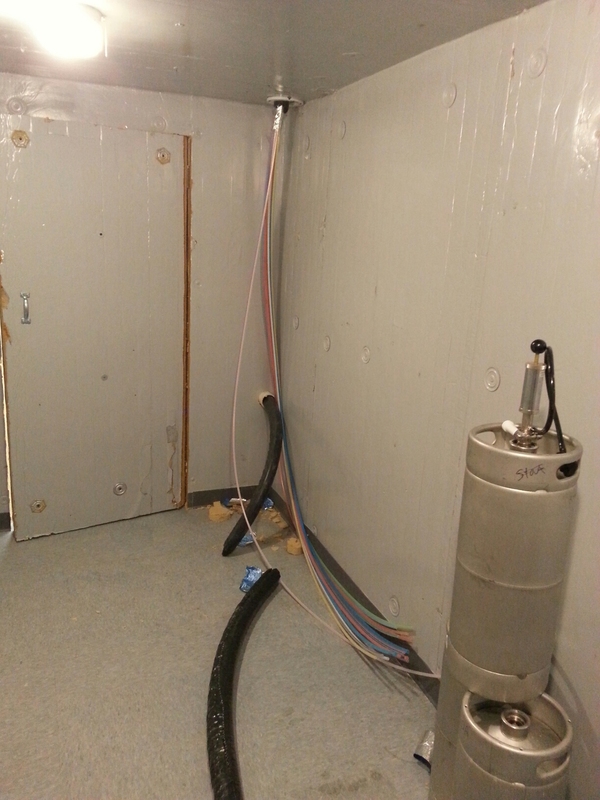 I had to cut holes into the cooler to run the trunk line (top) and the glycol lines (bottom). 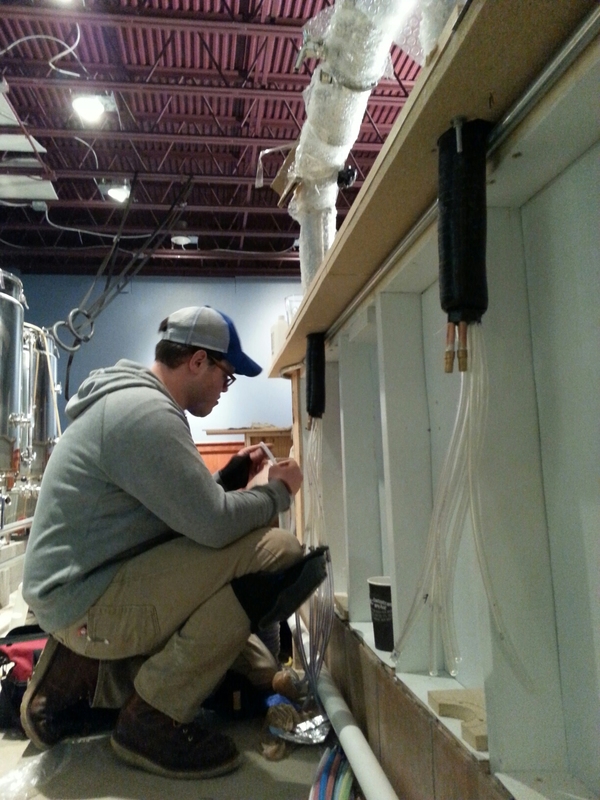 Jesse hooking up the CO2 manifold and regulators in the cooler. Done here! Final foil/thermal wrap and vapor barrier wrap. Alex running the individual lines into the cooler. 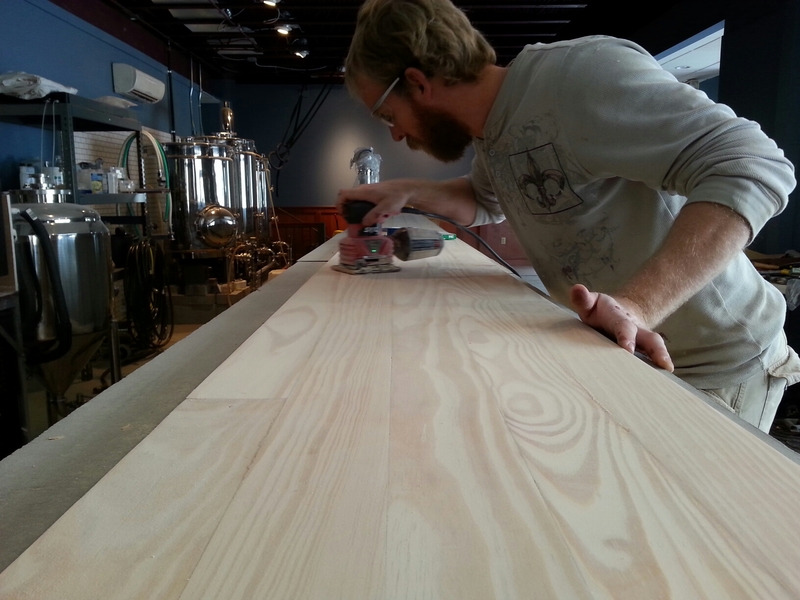 My Dad, sister and I spent a lot of time sanding the bar top to get it ready for stain. 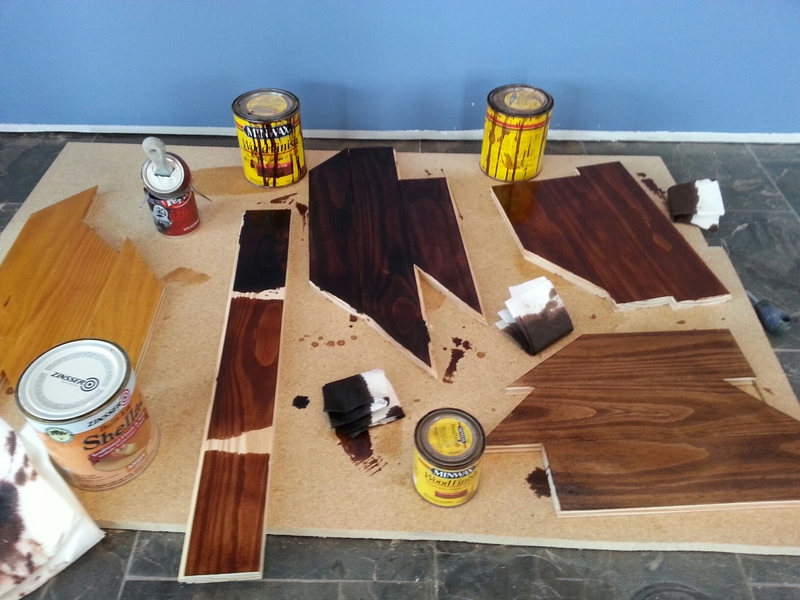 I also used some extra pieces of wood and stained/varnished them. Trying various stains and clear-coats on some scrap bar pine. A number of experiments are above. Far left is a ‘amber’ shellac on unconditioned pine – about 4 coats. Next is a plank of all three stains I tried WITHOUT the wood conditioner. The right three (bigger pieces) are WITH the wood conditioner. People preferred, hands down, the top right ‘English Chestnut’ stain with wood conditioner. Wood conditioner allows the stain to penetrate more evenly. See the skinny plank? It has a lot of contrast due to not being conditioned. Although it looks cooler, on a big bar it could look too busy. Receive the CO2 and N2 gases and finish the draft system. Possibly get the bar stained. Await for the State of Ohio inspection that I just got a call on. Alex from Bierpros was a huge help this week. He really knows his stuff. Jesse came down midweek to help too. 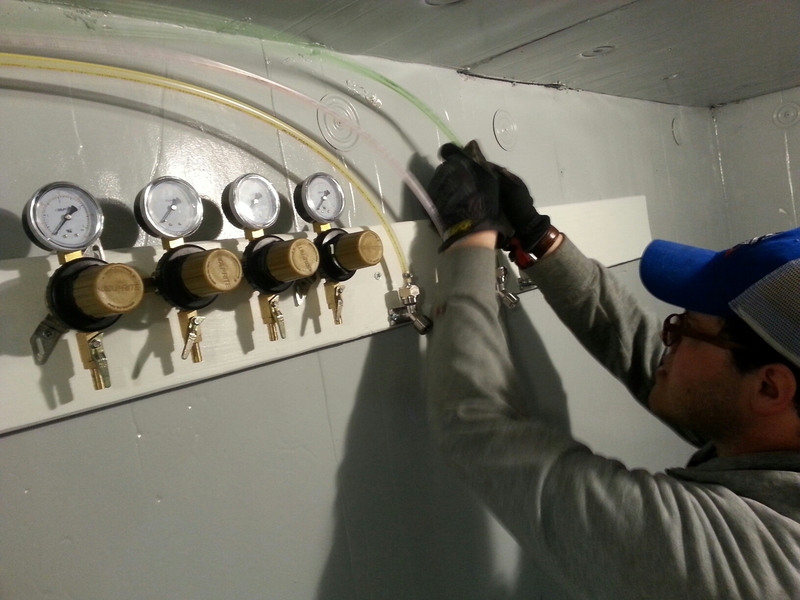 A big thanks on the cooler draft manifold! My Dad and sister did a lot of work sanding the bar top and other things.